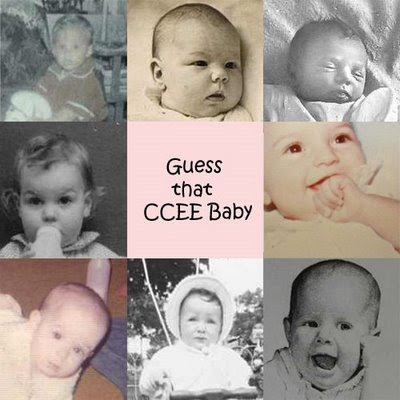 CCEE Stampers: Guess that CCEE Baby???? Happy Monday to you all. As you all know Monday's mean it is time for another CCEE Stampers challenge. This month is Cindy Motherway's turn to supply the challenges .... which mean we all start to shudder and quake wondering what she has gotten up into this time round LOL! 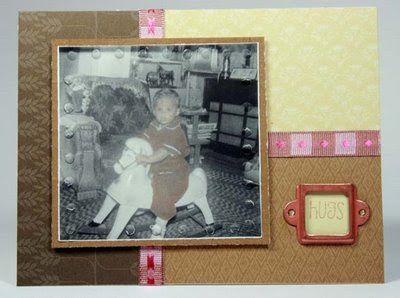 Make a card using your baby picture. This is going to be a limited supply baby picture card because we want our cards to not look like our cards, get it? · No fancy edges or borders using a fancy punch of any kind, no scallops, no nestabilities, no nuttin! · No fancy primas, no brads, no eyelets, no charm, no ordinary or extraordinary embellishments. · No sewing on any of the cards and no Thomas Kinkade landscapes! · No over the top, crazy complicated, triple and quadruple layered sketches! · You must use a piece of ribbon. 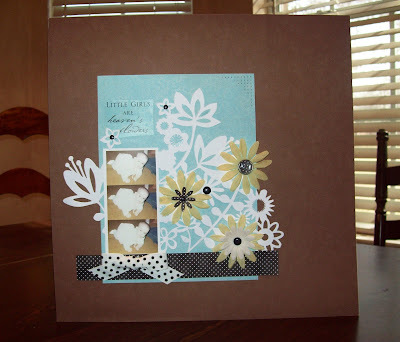 · You can use as many different colors of cardstock/designer paper as you wish. · You must make your baby picture the main panel, main focus. 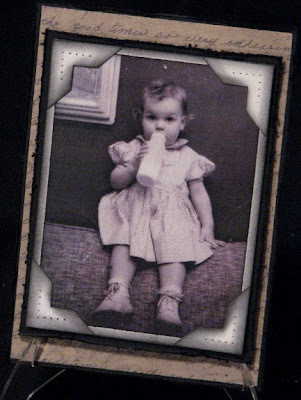 · You can use stamped images with your baby picture as long as your picture is the main focus. · You must try to keep away from what you feel is your signature look. Bossy isn't she ;) !!!!!!!!!!!!!!! I can tell ya this really got some of us scared, not being able to use our favorite things. If you go checking out our individual blogs today you will notice that we haven't uploaded our photo cards as we normally would ... that is cause we don't want you cheating ... you have to work out who you think belongs to each photo ... yes that is what we all looked like as babies ... cute weren't we hehe! To help you there are photos of each of us as we look today ... well recently anyway LOL. So post a comment and give us your guesses. Now it will be worth your while to have a go and try and guess this week cause we have a prize for you! What would be more appropriate than a set of baby stamps seeing it is a baby challenge. One lucky person will get to win this Rubber Soul Baby Stamp Set which has been kindly donated to us by Michelle from Stamper's Dream. You have until 12 midnight EST Saturday 17th January to be in the running for this prize. I will be editing this post tomorrow (Tuesday) to tell you which photo belongs to which designer. And those of us who post our CCEE projects to our blogs will be posting our photo cards to our blogs tomorrow also. So would you like to play along ... we would love to see your baby photos too ... so why not also make a photo card using one of your baby photos. Too hard finding a baby photo of you at short notice ... well any photo card will do ... we would love to see your ideas. Don't forget to come back here and post a link in the comments section of this blog post. If you upload your card to SCS please don't forget the keyword CCEEC. Ok now it is time to see our creations this week. I will be posting the pics of our projects in a random order ... not how I normally would post them. Oh and you will also notice I am not including the name of the designer of the card etc .... until tomorrow. *Edit .... I have added the names of who belongs to which photo card below .... if you want to read their story about this challenge click on the link provided above the photo. ok so as not to confuse you all the one below is an extra one created by one of the CCEE team for one of our members :) ..... I bet you can tell who this is supposed to be hehe! *** Well I think you all guessed that this is a photo of Cindy Motherway hehe .... so who made it ... hmmmmmm. Cindy might be gunning for them LOL! Ok I will tell you ... it was Dawn Lusk! Great Challenge. I think ... in fact I'm almost positive that last card, the baby with the M&M t-shirt, is Mothermark!! ROFL! Well done ladies. All the cards are wonderful and very clever. It will require some thought to make any sort of guess - except for the brilliant one at the bottom! Now who could that be??? I think the one with the grid background has to be my favourite, but so hard to choose. And all such cute pics. I only have one of me as a baby, after that they start about 4 years old. What a fun challenge to see the results of! So many cute babies can only result in cute cards! Okay, who's idear was it to make the polka dotted M & M baby? Hootsie, that better be revealed tommorrow too so that I can send out the formal letter and notice of probationary period! And don't you think for once that this probation is from making our challenge cards cuz many of you are so busy that would be a *good* thing! No, the probation period involves using your favorite embellishments, cardstock, coloring techniques and maybe even family members. I have a whole day to think sumthin' up!! And another thing, when is it my turn again to assign the challenges? I might have to do some scheduling changes!! Snort! I am leaving another comment after thinking about this one.....that baby is in an M & M outfit. That is so Charlene (Bertie)and her birthday is in just a few days.....the thing that worries me here is the polka dots!! Is this a rendition of what a combination of Bertie and Gertie would look like as a baby with an old and aged face??? No worries! Comment 6 and 7 won't win the contest! Giggle! Hee hee the cutest baby is the last one by far. Awesome job girls, so sweet. haha...great job girls...too cute! and that OLD baby at the end *shock*....tooooo funny!! I want to change two or three, but I am going to go with this. Can we guess more than once? Hee Hee!!! What a FUN....but hard games. I can't wait to see how many will get them all right or at least 1. Love all the fabulous cards you all created and that last one is a hoot. Thanks for a fun game and a chance at some swee candy. These cards are fantastic! But, this was so not easy! I was sure, then I changed, then I looked at the other guesses and I don't match any of them...and they don't seem to match each other very well...so I figured it's best to go with my first instinct. It was fun guessing...can't wait to see the results! I can't wait to find out who is who! Good challenge Mothermark. Your were all beautiful babies. It was very hard to guess who is who, but I am going to try it. Here goes. A wild stab in the dark, because I am no good at this - most babies look like each other to me! Top row: Dawn, CindyM., CindyH. Thans for the chance to win! I can't wait to see How any I got right!! What "cutie patooties"!!!! A fun challenge! Cindy M's creative brain really kicked into overtime on this one didn't it? The only one I feel I could be right about is Cindy M (at least I think so). All of the cards are absolutely wonderful.. What a great challenge. This was really hard.. Here is my guess though! Thanks for the opportunity to play and win! I am even having a hard time figuring out who I am, I am so cornfused! 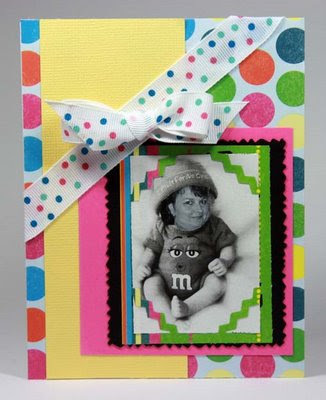 I love the m&m baby card. Let me see if I can guess you cutie pies! This is my guess at who's who. I wanna be the M&M baby. Can we start over? LOL!!! Thanks for a fun challenge, MM! Oh, by the way, I DID follow the rules!!! Ok, I stink! Only 3 out of 8!!! That was great! Love these! That looked like great fun! All the baby pics are so cute! Thanks for the chance to win! The baby pictures are so cute. And I love the layouts as well. Thanks for the chance to get in on the contest and for the great giveaway. You've inspired me to make baby photo bithday cards for each of my 9 siblings. I will make a duplicate card to send to my Mum and Dad on each of the kids' birthdays. What a fun challenge! I'm so excited you girls have a blog - I will be tuning in daily! what a perfectly fun way to host a giveaway!!! I would never have guessed which photo went with which crafter!! !